ABC Commercial has just launched the 2012 ABC Shop Father’s Day Campaign to attract customers to ABC Shops, ABC Centres and ABC Shop Online. To view the television promotion, go to http://youtu.be/Jxv-dCN9oyI. This year ABC Shop are focusing on exclusive content to drive customers to ABC Shops and Centres and to encourage customers to put ABC products top of mind when they are considering what to buy Dad for Father’s Day. 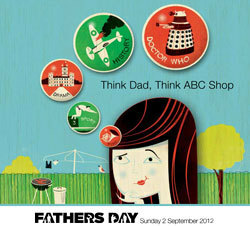 Father’s Day 2012 has taken ABC1’s positioning line ‘think entertainment, think ABC1’ and extended it to support the shop branding with the line ‘Think Dad, Think ABC Shop’. Key products include Downton Abbey; John Clarke’s Sporting Nation; Gladiators of WWII (exclusive); Doctor Who clothing range (exclusive); QI Series 9; Bert Hinkler – the Most Daring Man in the World; and Man Sized Classics CD (exclusive). This year we are also running strip ads in key suburban, local and commuter press nationally (in such publications as MX and the Manly Daily for example) in the week leading up to Father’s Day. So keep a look out for the campaign and if you are looking for the perfect Father’s Day gift, then you can’t go past your local ABC Shop!